SFE Global > News > News > May 15, 2013 – Got Inflow & Infiltration? 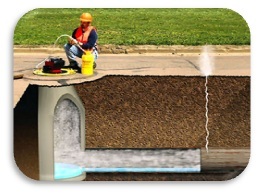 Consider Sewer Smoke Testing. 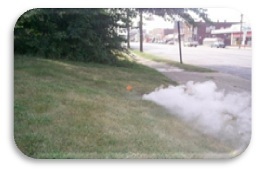 Many of SFE Glo bal’s smoke testing programs have immediately located major sources of direct stormwater inflow. Many feel that smoke testing your sanitary sewers in an effort to locate sources of I&I is the best “bang for the buck” when it comes to assessment options. 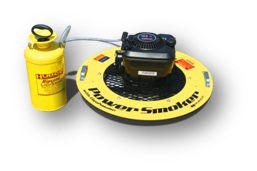 Smoke testing typically goes hand in hand with sewer flow monitoring, CCTV, and manhole inspections programs. This service gives immediate visual results and usually allows Cities to make quick decisions on rehabilitation efforts, sometimes resulting in a dramatic decrease in I&I. So when is the best time to perform smoke testing? The vast majorit y of our smoke testing programs will start in spring and into the summer months. Best results are achieved when ground water is down and there’s limited chances of high wind and rain. Poor weather and high ground water tend to limit the effectiveness of your smoke testing program.